We have established a stable supply of conger eels and giant squid,through Sakana del Peru S.A. (SAPESA), our subsidiary located in Paita, Northern Peru. Two managers from headquarters are permanently assigned to Peru, thoroughly controlling all aspects of management, operations and quality. SAPESA meets all EU hygiene standards based on HACCP, in order to be able to guarantee the security and safety of the food. Processing line for conger eel in Sakana del Peru S.A.
TAFCO is a pioneer in the conger eel operation since 1991. We catch conger eels using our own boats and discharge them alive, and carefully produce butterfly cut products under very strict quality standards. The products of SAPESA have maintained a leading Japanese market share ever since its foundation. Focusing on global markets, we are now strengthening sales to South Korea and to other countries. Processing line for giant squid in Sakana del Peru S.A. Giant squid is also a main product of TAFCO. There is a stable supply available, and various parts of the squid such as fillets, tentacles and wings are sold not only in Japan but also on the global market including China, Thailand and Spain. SAPESA adheres to very strict standards in terms of material purchasing and processing, resulting in its products consistently receiving high levels of evaluation from customers seeking high-quality products. Since 1968, we have been selling to the Japanese market wild “Suriname shrimps,” that have red spots on their tails known as “Kiss marks” and which are famous for their high rarity value. 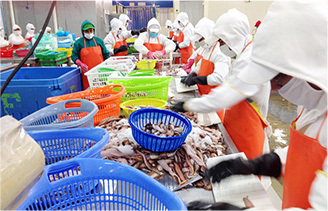 Our partner company in Suriname catches the shrimps and we purchase them processed in head-on or in tail products from a factory that is certified under EU standards, and subsequently sell them in China and Europe. With the delicious taste and texture unique to wild shrimps, Suriname shrimps are mainly used in salt-grilling or tempura to make the most of their natural taste. We sell alfonsino, toothfish, Greenland halibut, boarfish and black cardinal fish, etc., which are caught by TAFCO owned vessels, in addition to affiliated overseas and Japanese vessels. Using these raw materials, we produce sliced portion and its marinades at our Japanese group processing company Akatsuki Gyorui Co., Ltd., and bone-removed fillets at cooperative processing companies overseas. Sales are conducted at various different outlets such as co-op stores and mass retailers.